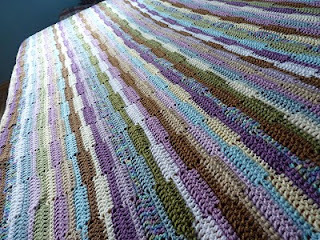 You might remember this post from October, in which I wrote up the pattern for my Ribbon Afghan. 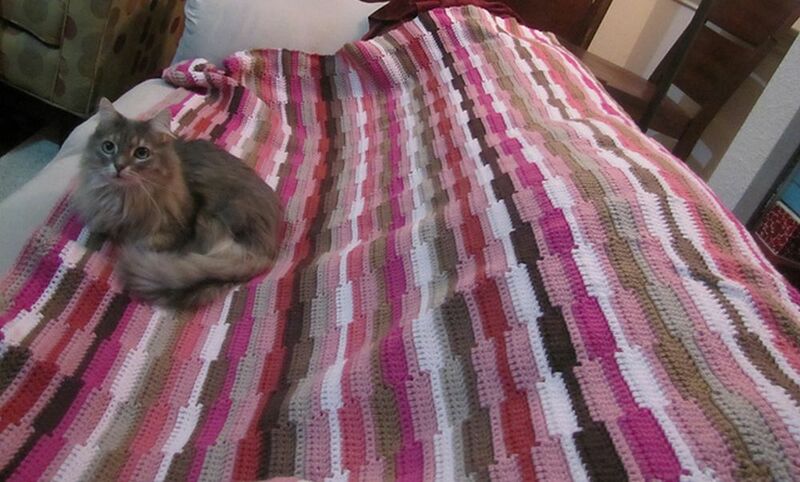 Cheryl's blanket - look at that gorgeous cat! Although the others are nice I love yours the best. The range of colors you used is wonderful. Off to Ravelry to look at your blankie. How exciting, to have others using your pattern. I think it's a lovely compliment to your design. Outdone? Hardly. Theirs are different but no better than yours. And what a compliment, anyway, when your design takes on a life of its own. ps- I love that blanket. I'm totally jealous that you've inspired so many lovely blankets! All the blankets are lovely! I'm sure so many people will enjoy snuggling up in such beautiful creations for years to come. I do love all the blankets, but I too like your colors the best, they are so calming! I love the blanket. Thank you. But Im still stuck on the gauge portion. That's because I ALWAYS skip it.....Help!!!! please. 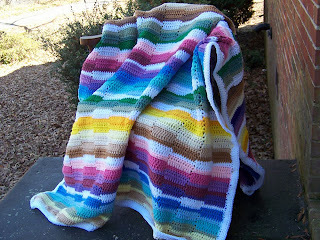 BUT if you want the blanket a specific length, e.g. to cover a bed or sofa, you have to work out the length in advance, otherwise your blanket might be too short or too long. This is where the gauge comes in. So you chain 12 stitches, do your first DC (tr) in the fourth chain from the hook and then do one DC (tr) in the next nine stitches. This gives you a group/unit of 10 DC (tr), which is the basis for this blanket. Why 2 extra chain? You do two extra chain stitches and do a DC (tr) in the fourth chain from the hook. The three chain stitches at the beginning make a 'fake' DC, the first stitch). As I said, you might be the type of person who likes to live dangerously and just starts by chaining a random number of stitches, but what often happens to me is that my starting chain is shorter (the chain stitches are a bit scrunched up and tighter than regular crochet stitches.) If I do a starting chain and then measure it, it might be the case that my chain is 60 inches long. But when I start crocheting into it, the chain stretches and I could end up with an 80-inch blanket that's way too long! I hope this made some sense! No problem at all! I normally like to skip the gauge (shh, I didn't tell you that) but when you're crocheting along the length, it's important to have a rough estimation, otherwise you'll be crocheting till kingdom come :-)) It's hard to work out the length of your blanket based on the chain alone (because it's so stretchy) so just taking five minutes to measure a few stitches certainly saved me hours of work later! Best wishes and best of luck with it! Thanks for this great pattern. Off to give it a try. Will add to Rav. Love how this turned out and goodness knows I have the scrap yarn left after my Over a Rainbow to start another. I can't wait to start this pattern with red,teal,tan, olive,navy to make it look a little "Navajo"
I've been searching for a pattern to crochet certain colors for a more "Navajo" look. I think your pattern will work! Thank you so much for sharing it! I love the colors of a dark red, teal,dark olive, navy, purple,light and dark tans. I found a Hobby Lobby yard in I Love This Yarn called, Dakota, which has all these colors in a varigated, beautiful yarn!! I love it and it is sold out at the warehouse and will be months before I can get my order. In the meantime, I have all the colors to incorporate into this beautiful pattern. Thanks so much! I appreciate a great crochet talented person!